Slim profile steam head to help clean tight areas. Throw out the mop and bucket and clean easier than ever before with the Agile. The HAAN Agile features a swivel-head, low-profile design that allows easy maneuverability around furniture, cupboards and anything else that might be on the floor. It cleans and sanitizes sealed hard-surface flooring without having to use harsh chemicals and detergents, killing 99.9% of household germs, bacteria and dust mites. A removable water tank can be filled at the tap and the Agile is ready to clean in just 20 seconds. Lightweight design and thoughtful engineering help you to achieve an effortless clean that will leave your floors spotless, streak-free and practically dry. Included are 2 reusable Ultra-Microfiber cleaning pads, resting pad and a Carpet Glide attachment to sanitize and deodorize carpets and rugs. Kills up to 99.9% of germs without chemicals. Swivel head included for easy maneuvering. Carpet Glide attachment sanitizes and refreshes soft surfaces. Ready to steam in 20 seconds. 25 minutes of steam cleaning. Includes 2 reusable Ultra-Microfiber pads. Swivel head design for easy maneuvering. 1. Clean and sanitize sealed hard flooring surfaces like tile, laminate, hardwood, vinyl, stone, marble. The Agile works great for breaking down stuck-on messes or everyday mopping/dusting. 2. Attach the carpet tray to sanitize, refresh and deodorize carpet, area rugs, mattresses, upholstered furniture, pet beds. 3. 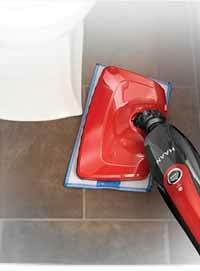 With the touch of a button, remove the pole to easily bring steam cleaning from the floor to countertops. 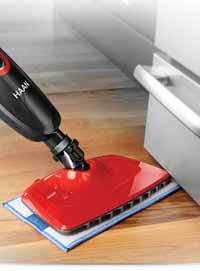 *HAAN always recommends testing an isolated area of the surface to be cleaned before proceeding. Thermal view of HAAN heat distribution. 15 steam jets evenly disperse steam across a wide cleaning path. *Size and shape of water tank and product may vary by model. 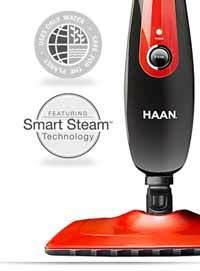 Smart Steam Technology enables HAAN products to deliver a superior cleaning experience from the time the box is opened. All HAAN products are easy to assemble and easy to use. They have been designed with style in mind, but it’s what is behind the sleek exterior that gives HAAN its Smart Steam Technology advantage. Machine-powered pumps, water heaters, steam jets and Ultra-Microfiber cleaning pads have been engineered specifically for each model to kill up to 99.9% of household germs and bacteria, providing an exceptional clean. 2. Steam Pump: Machine-powered steam pumps provide consistent steam emission and eliminates the need for you to manually pump. 3. Heater: Newly integrated Micom circuit heaters shorten heat up time to 20 seconds. 4. Steam Jets: 15 steam jets evenly disperse 212° steam across a wide cleaning path. 5. Ultra-Microfiber Pads: 4-layer thick Ultra-Microfiber pads create a streak-free, quick-drying, effortless clean. The concept of using steam to clean and sanitize is simple. Dirt and grime adhere to household surfaces; the heat of steam breaks the bond between the crud and surface allowing it to be easily removed. The consistent heat of HAAN steam simultaneously cleans and kills up to 99.9% of household germs, viruses and even dust mites in just one second. 1. 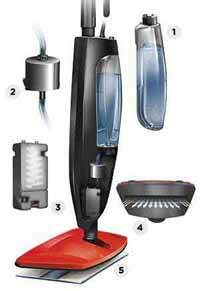 One-step Cleaning: Steaming cleans and sanitizes in one simple step. No bucket and no chemical cleaners needed! 2. Deodorizes: Steam kills odor causing bacteria on cushions, pillows, pet bedding, curtains, sneakers, stuffed animals and backpacks. 3. Chemical Free: Steam cleans and sanitizes without chemicals for a gentle clean. This also means that no harmful fumes or chemical residues will end up on (or in!) your family and pets. 5. Multiple Uses: Don’t just use steam to mop, use it to make other household chores healthier, less expensive and, often times, easier.